Clever Confidante by Julie Webber: Does This Lighting Make Me Look Fat? Does This Lighting Make Me Look Fat? As they say on Sesame Street, "One of these things is not like the other!" Hmmm...what could that be? Trust me, size matters. 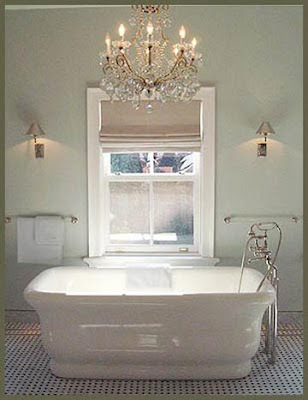 Like this person, I have a chandelier I adore and wish I could use it in my current house. I fiercely protested against my mother telling me it was too big for 8 foot ceilings. Usually my determination can overcome huge obstacles, however, in the end, mother knows best. My chandelier sits in bubble wrap amongst Halloween and Christmas decorations in storage. Sigh...I guess it could be worse. 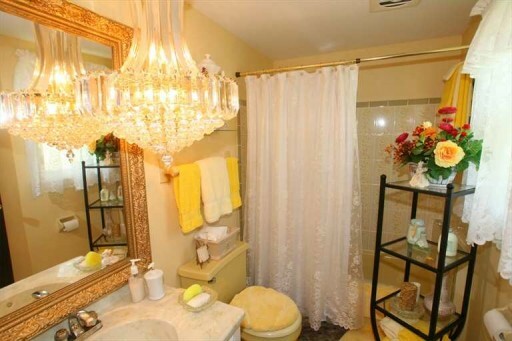 It could be hanging above a sink in a tiny bathroom with waaaaaay too much stuff in it. Yes, bathrooms and kitchens help sell houses but an over-sized fixture doesn't trick the buyer into thinking they just emerged from Cal-a-Vie Spa. Rest in peace Liberace.